Going into the season, Jarrod Saltalamacchia was lined up to function primarily as the Tigers backup catcher. 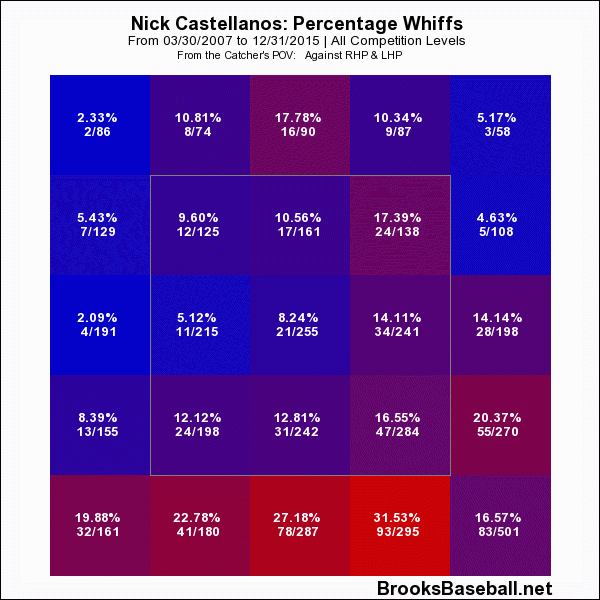 The switch-hitting backstop was known for doing damage against RHP, but his lack of defensive skill and weakness against lefties made him something less than a full-time player. That’s why the Tigers got him for basically nothing. Yet one McCann injury and 55 strong PA later, Salty is enjoying quite the honeymoon in Detroit. His 176 wRC+ is something you might expect from Cabrera, propped up on stats that would make Adam Dunn blush: 12.7 BB%, 38.2 K%, .408 ISO. This is obviously a small sample size kind of thing, as no one would suggest Salty is actually one of the five best hitters in baseball. But this impressive stretch is somewhat compelling, even given the acknowledgement that it isn’t sustainable in any way. It’s interesting because this is essentially the best 15 games of Salty’a career offensively coming right after the worst stretch. 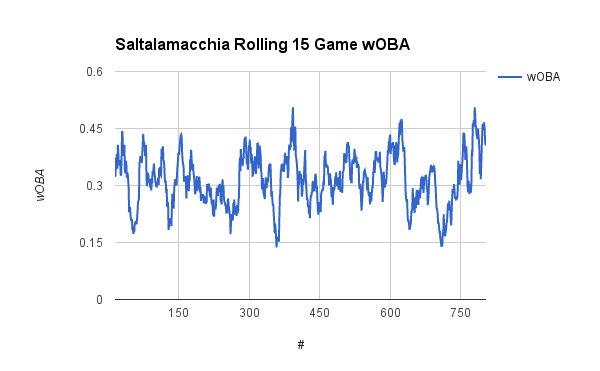 The graph below shows his rolling wOBA average over 15 game samples. He’s done this before on two occasions, but it’s striking how bad he was leading up to this year. What’s most interesting to me is that Salty has really sold out for power. The rate at which he’s pulling balls and hitting fly balls is off the charts. I don’t want to make a whole lot of a couple dozen batted balls, but it lines up with the general idea: Salty is looking to do damage and doesn’t mind if he strikes out in the process. That’s always been true, but right now it’s working. Salty’a hot start doesn’t mean he will keep hitting like this forever, but I think he’s demonstrating proof of concept. He can provide the Tigers with some left-handed thunder off the bench to keep teams from exploiting the RHH heavy Tigers late in games. The Tigers really lacked a power bat off the bench the last few years and if McCann comes back and performs, Salty can be that. If McCann struggles, the Tigers appear to have something more than a replacement level option on which to fall back. From a simple results standpoint, Jose Iglesias is off to a very nice start. In 49 plate appearances, Iglesias has a .326/.408/.349 line with a 128 wRC+. His .350 BABIP is a little above his career norm and his ISO is well below his career norm, so this isn’t the kind of line you’re going to look at and totally dismiss as small sample noise. I don’t think Iglesias will continue to hit like one of the best two dozen hitters in the league, but the line does come with a very interesting indicator. Iglesias has walked 12.2% of the time and struck out just 6.1% of the time, both of which would be career bests. Now 50 PA are just 50 PA and I don’t think Iglesias has become Stan Musial, but this is a promising trend. Iglesias’ swing lends itself to higher BABIP than average because he doesn’t hit a lot of fly balls and has the ability to beat out infield hits. I wouldn’t bet on .350 for his career, but .320 to .330 seems plausible. If he can do that while also walking at or above league average and almost never striking out, he would be a great player. Let’s say he can walk 10%, strike out 7% of the time, and post a .330 BABIP. Say he hits 4 HR and 20 doubles. That’s a .340 wOBA, give or take. Even if he’s just a slightly above average defender at shortstop, that’s a 4-5 WAR player. If he’s actually does become a great defender, that’s a borderline MVP. Iglesias was already a great contact guy in 2015 and so far he’s improved his contact rate (contact/swings) by 5.5%. He’s done this by being more selective, both in and out of the zone. 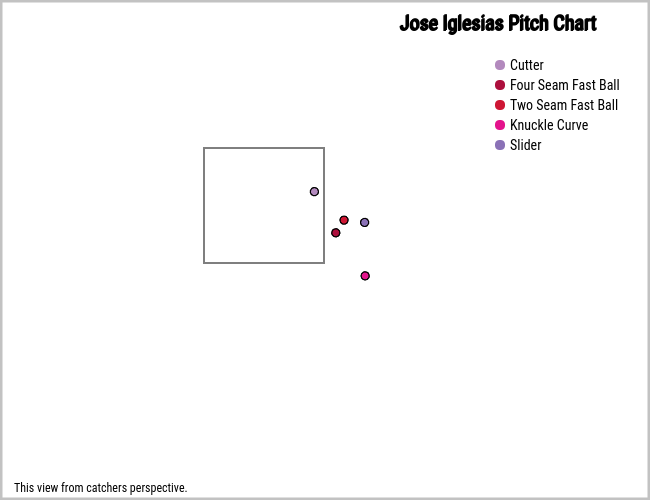 Iglesias has terrific bat-to-ball ability and so far he seems to be getting better at knowing which pitches to avoid. It’s still early, but this is definitely something to watch. A player with this kind of strikeout zone command, contact ability, and batted ball profile can be very valuable even without much power. 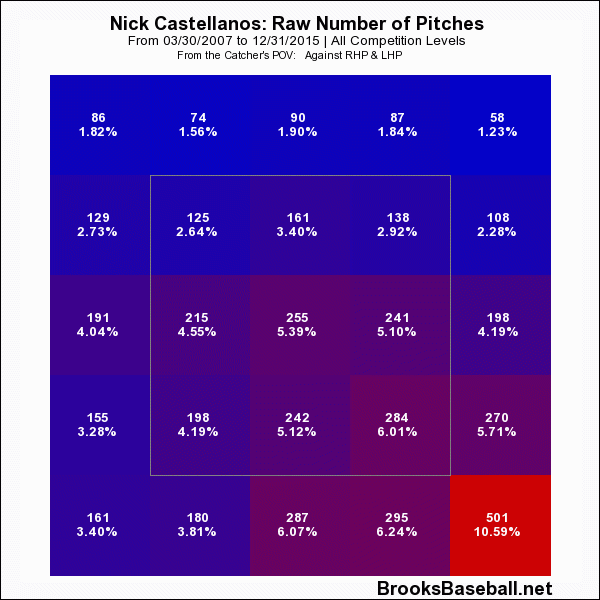 And while it’s only been 49 PA and 193 pitches this year, it continues something we saw from him in 2015. We’re less than 12 hours removed from literally the team’s first game of the season and I have no intention of making too much of anything. But I do want to call attention to one aspect of Verlander’s start that didn’t get openly discussed last night: his curveball. Here’s a Brooks Baseball chart of his horizontal and vertical movement carved up by season. Brooks hasn’t updated to include the 2016 numbers on the full player pages, but I’ll do the work for them because this will be simple. I only added in the curveball, but that’s the topic here. The movement on his curveball is similar to what he was throwing in 2012. The group of three curveballs in the upper left are 2007, 2008, and 2015. The bottom right are 2010, 2011, and 2012. (That makes the middle three 2009, 2013, and 2014). Here’s the link to the page if you want to actually explore. I’m not going to suggest 16 curveballs during one start is some sort of definitive statement about his return to dominance, but put it together with solid average velocity (93.6 mph) and 16 whiffs (plus a foul tip) and you have yourself a nice Opening Day start. Five strikeouts, two walks, and three runs over six innings isn’t an outstanding line, but there were clearly things to like about our first look at Verlander this year. Every year, Ernie used to read this quotation from the Song of Solomon on Opening Day. Two years ago, I heard a priest recite this in Ernie’s name in reference to the rebirth of baseball, Spring, and Easter. It’s almost Opening Day, so time to roll out the annual New English D over/unders. You all know how this works. I’ll be setting the value at what I expect to be the mean value. So I’m setting the over/under at 87.5 wins, meaning I think it’s equally likely that they win more games as it is that they win fewer games. Feel free to suggest others in the comments section and weigh in on where you stand on some of the more interesting ones. Every year, I write two posts during the final week of the season. The first is my Thoughts on The Winter in Detroit article in which I give my thoughts on the offseason and assessment of how well the Tigers will do in the upcoming campaign. Think of that post as the realist’s version of the state of the team. The other post is this one, what I call the Screw It article. This is where we put on our unbridled optimism hat and imagine a world in which everything goes right. In other words, if the Tigers win the World Series, it will look like this. Let’s consider the evidence. There is no powerhouse in the American League Central. All of the league’s truly great teams play in the Senior Circuit. The Cubs, Dodgers, Pirates, and Giants (and also the Mets, Nationals, and Cardinals) will have to battle to represent the National League, but I’m not sure there is a single American League team that I’d feel comfortable forecasting for 90 wins. Of course, a couple will win 90 games, but I have no idea who they will be. The Twins have the potential to score runs, but a lot of that is riding on young players who haven’t fully established themselves. And even if they score runs, their starting rotation and bullpen are unimpressive and will surely give many of the runs back. The Twins aren’t going to go down easily, but on paper they are clearly worse than the Tigers. The White Sox did a nice job making themselves not terrible this winter, adding guys like Avila, Lawrie, Frazier, Jackson, and Rollins, but there isn’t much ceiling or depth on this team. They won’t have -1 to 0 WAR guys at several spots this year, but there are only a couple players on the roster capable of producing solidly above average numbers. It’s not that the Sox aren’t a threat or are incapable of winning the division, it’s just that they have little room for error. I’d say they’re heading for 82-84 wins, but they would need a lot of guys to have career years to take the crown. Cleveland has the division’s best rotation and some good players (Lindor, Brantley, Gomes, Santana, Kipnis) but their bullpen is shallow behind Cody Allen and they have at least two vacant spots in the lineup at CF and RF. I would wager they are the best team in the division, but it would be hard to survive an injury to one of their top three starters or their terrific shorstop. Cleveland is a very real contender, but the Cubs they are not. The Royals are the defending division and World Series champs, but their starting pitching is weak. Maybe Kennedy and Volquez have good seasons and the Royals win the division, but it’s hard to see them pitching well enough to be a great team. Again, their position players and bullpen could easily carry them to a division title, but I don’t think they’re in a position to run away and hide. Which brings us to the Tigers. The division is winnable because while the Tigers are not a perfect team, they aren’t chasing any perfect teams in the Central and they have plenty going for them. They have the best lineup core in the division with Upton-Cabrera-Martinez #1-Martinez #2, and that doesn’t include Kinsler or any gravy they can get from Castellanos, Iglesias, McCann, or Gose/Maybin, all of whom have some decent claim on potential for 2016. There are no guarantees in baseball, but the Tigers look like they should have the best offense in the division. If you believe the projection systems, the Tigers problem is their pitching. In particular, the rough stretches from Verlander and Sanchez seem to suggest the Tigers won’t have any top level starters in 2016, nor enough depth to negate that disadvantage. 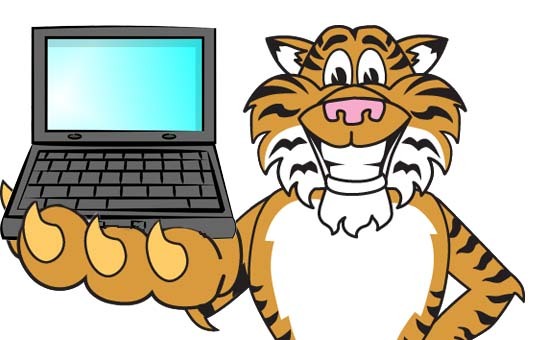 But as we’ve discussed a few times, there are totally plausible scenarios in which the Tigers pitching comes together, and this post is designed to explore exactly that. Verlander was great down the stretch last year and if you are someone who believes he’s finally healthy and has cured what ailed him, a 5-win season from Verlander is absolutely a reasonable prediction. The same is true for Sanchez, who has dealt with injuries off and on for many years, but he showed plenty of good stuff in 2015 and if he’s healthy and refreshed, there’s no reason he can’t have a quality, above average season. The numbers say Zimmermann is going to wind up giving up more homers than you’d like this year after moving to the AL and Comerica Park, but he had an ace level season just two years ago in 2014. A few more strikeouts and a couple fewer dingers than expected and Zimmermann could be a solid #2. Mike Pelfrey isn’t exciting, but his upside is a 2 WAR pitcher and he’s done that a few times. He could easily find his way there again. Shane Greene showed lots of promise in 2014 and in early 2015, but an injury turned him into a zero for most of the year. 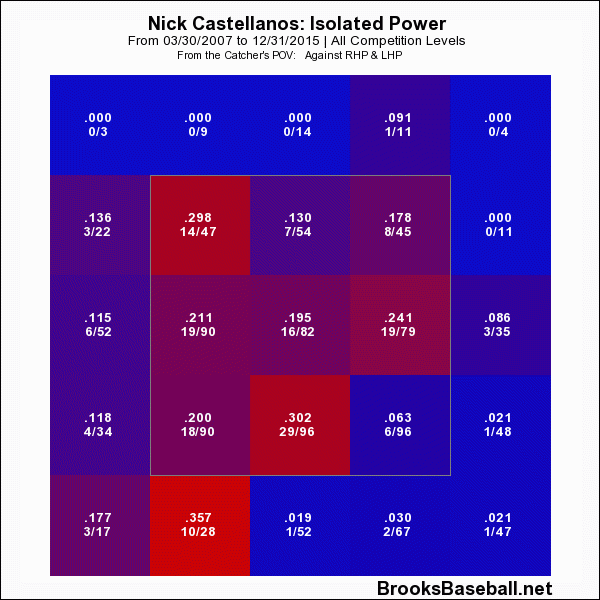 For a guy with so little MLB time, the horrible starts last year drag down the expectations, but if his nerve issues have resolved themselves and he can feel his fingers, he could definitely give the Tigers a boost. And that’s before you factor in any love for Norris, Boyd, or Fulmer, all of whom have breakout potential. The rotation, if you’re a betting person, might not look like an upper echelon group, but you don’t have to squint that hard to see a scenario in which they are. The bullpen, the classic Tigers weakness, looks better for 2016. Losing Hardy and Alex Wilson for the start of the year isn’t ideal, but they have K-Rod, Lowe, and Justin Wilson to anchor the back end, along with Farmer, VerHagen, Ryan, Kensing, and some other interesting pieces to handle middle relief. This won’t be a dominant pen, but if Rodriguez, Lower, and Wilson all perform reasonably close to how they pitched last year, the number of bullpen meltdowns will be a lot easier to swallow than last year. Imagine this team: Top tier offense, solid rotation, average bullpen. It’s enough to put the team right near the top of the AL Central, and if they get the kinds of performances I described from those key players, they will likely win the division. And nothing I said here is a stretch. 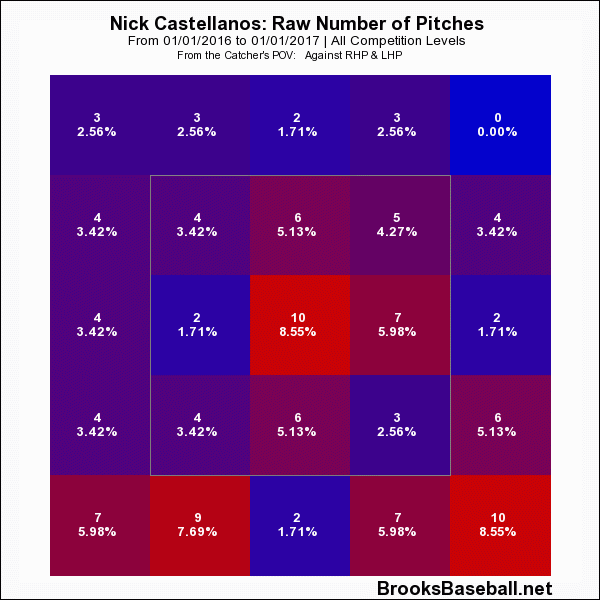 I don’t like to do pie in the sky “hey what if Castellanos had a 7 WAR season” stuff. If they get solid contributions from the bottom of the lineup and the pitchers land a little on the positive side of their projections, this will be the best team in the Central. And once they win the division, all bets are off. With the lineup they have, they could easily roll over any team in the AL in a short series, deploying their back end starters in middle relief to stabilize any issues that crop up. Beating the Cubs, Dodgers, etc in the World Series would be tough, but all it takes is one or two great starts – something the Tigers pitchers have shown an ability to do – to finally win the last game of the season. As I noted earlier in the week, this isn’t necessarily the way I expect the season to play out, but you don’t have to dial up the good fortune too much to wind up here. If the bats do what they should do, and the pitching does a little more than they should do, they’re the best team in the division. And in the AL playoffs, it’s anyone’s guess, so the last step will be toppling the NL champ, a thing any team can do over a few games. The Tigers aren’t the favorites by any means to win the World Series, and you can write this story for almost any team in some fashion, but this is an 86-88 win team that has room to grow into a 92-94 win team that could win it all. And baseball is chaos, so screw it; the Tigers are going to win the 2016 World Series.